Maxwell M. "Max" Scherzer (born July 27, 1984) is an American professional baseball pitcher for the Washington Nationals of Major League Baseball (MLB). He has also played in MLB for the Arizona Diamondbacks and Detroit Tigers. A two-time Cy Young Award winner, Scherzer became just the sixth pitcher in Major League history to throw two no-hitters in a single season in 2015. On May 11, 2016, Scherzer tied the major league nine-inning strikeout record with 20, against his former team, the Detroit Tigers. Scherzer was born and raised in Chesterfield, Missouri, the son of Jan (Shirck) and Brad Scherzer. After playing for Parkway Central High School in his hometown, Scherzer was drafted by the St. Louis Cardinals in the 43rd round (1,291st overall) in the 2003 Major League Baseball Draft but did not sign and instead attended the University of Missouri in Columbia, Missouri. He was then drafted again in 2006 by the Arizona Diamondbacks, this time in the 1st round as the 11th overall pick. He was Mizzou's first-ever 1st round MLB pick. On January 9, 2012 it was announced that Scherzer would be one of six new inductees to the University of Missouri Intercollegiate Athletics Hall of Fame. While at Mizzou, he won Big 12 Pitcher of the Year in 2005. Following his freshman year at the University of Missouri, Scherzer made his debut with the La Crosse Loggers of the Northwoods League (NWL), a collegiate summer baseball league. He went 2-1 that summer with a 1.91 ERA with 6 saves. He also struck out 50 hitters in only 33 innings pitched. He was named a mid-season All-Star. 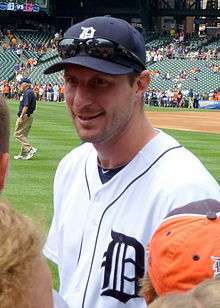 Scherzer was selected by the Arizona Diamondbacks with the 11th overall pick of the 2006 Major League Baseball Draft. However, he and his agent, Scott Boras, failed to reach an agreement with the club. Scherzer thus began his professional career with the Fort Worth Cats of the independent American Association. After appearing in three games, Scherzer signed a $4.3 million contract with the Diamondbacks. He began playing in the Diamondbacks organization in 2007 with the Single-A Visalia Oaks. He was promoted to Double-A Mobile BayBears after three impressive starts for the Oaks. During the 2008 offseason, he was named the fourth-best prospect in the Diamondbacks organization. After a good start to the 2008 season in Triple-A Tucson he was called up to the Diamondbacks on April 27, 2008. On April 29, 2008, Scherzer made his MLB debut against the Houston Astros when he came on in relief and threw 4 1⁄3 perfect innings while striking out seven. While doing so he also set the record for the number of consecutive batters retired (13) for a pitcher making his MLB debut as a reliever. The previous record was 12 set in 1962 by the Dodgers Pete Richert. The seven strikeouts were one short of the major-league record for most in a debut relief appearance. The Pirates Barry Jones had eight on April 20, 1986. On April 30, 2008, the Diamondbacks announced he would be placed into the starting rotation, due to his impressive debut. In his first appearance as a starter for the D-Backs, Scherzer allowed five runs (two earned) in four innings, while striking out five, taking the first loss of his major league career. He returned to the bullpen for much of the 2008 season. He started against the Cardinals, his home town team growing up, on September 24 and lost for the fourth time in his career in a winless season, going five innings, allowing seven hits and four runs (two earned) while walking two and striking out four. Scherzer became a full-time starter in 2009, filling the fifth starter role in the D-Backs rotation. He recorded his first major league victory in a 12–0 win over the Atlanta Braves on May 16, 2009. On May 26, Scherzer recorded his second win of his career. He finished the 2009 season with 30 starts, a 9–11 record, 4.12 ERA, and 174 strikeouts in 170⅓ innings pitched. After the 2009 season, Scherzer worked out in Fort Collins, Colorado with the Colorado State University baseball team. On December 9, 2009, Scherzer was traded along with Daniel Schlereth, Phil Coke, and Austin Jackson to the Detroit Tigers as part of a three team trade that brought Ian Kennedy and Edwin Jackson to the Diamondbacks and Curtis Granderson to the New York Yankees. Detroit optioned Scherzer to the Triple-A Toledo Mud Hens on May 16, 2010, replacing him with Armando Galarraga. Shortly thereafter he returned successfully to the major leagues, going 6–4 in twelve starts with an ERA of 2.62 and 85 strikeouts in 75 2⁄3 innings. On May 30 against the Oakland Athletics, Scherzer accumulated 14 strikeouts in only 5 2⁄3 innings pitched. This was the fourth time in his career to date that he had 10 or more strikeouts in a single game. He allowed two hits, four walks, and hit a batter on his last pitch before being replaced. That mark was tied for the most strikeouts in Comerica Park history with Jeremy Bonderman, and tied for second in franchise history behind Mickey Lolich, who had 16 strikeouts in one game. On July 26, Scherzer and Tampa Bay Rays pitcher Matt Garza took a no-hit duel into the sixth inning. Scherzer lost the no-hit and shutout bids after giving up a grand slam to Matt Joyce, while Garza went on to throw the no-hitter. On September 1 against the Minnesota Twins, Scherzer pitched into the 9th inning for the first time in his career. He gave up one run on four hits and one walk while striking out nine on 107 pitches, though he got a no-decision as the Tigers lost the game in the 10th inning. Scherzer finished the 2010 season with a 12–11 record, 3.50 ERA and 184 strikeouts. Despite spending some time in the minor leagues, his strikeout total was still good for 10th in the American League. In the 2011 season, Scherzer was the third starter in the rotation, and won six straight starts early in the year, being the first Tiger since Jeremy Bonderman in 2006 to accomplish this feat. He finished the season with a 15-9 record, and was 3rd in the AL in home runs allowed (29), 4th in wild pitches, 5th in hit by pitch (10), 9th in win–loss percentage (.625), and 10th in wins. On May 20, 2012, Scherzer struck out 15 Pittsburgh Pirates in seven innings, falling one strikeout short of tying the franchise record set by Mickey Lolich. His career-high 231 total strikeouts during the 2012 regular season placed second in the American League, behind teammate Justin Verlander's 239. His strikeout rate of 11.1 per 9 innings led the American League. He also finished the regular season with career highs in wins (16) and winning percentage (16–7, .696). Despite battling a late-season injury, Scherzer pitched successfully for the Tigers in the 2012 post-season. He made three starts, going 1–0 with a 2.08 ERA, while striking out 26 batters in 17 1⁄3 innings. He pitched Game 4 of the 2012 World Series against the San Francisco Giants, the first World Series appearance of his career. He gave up three earned runs in 6 1⁄3 innings while striking out eight batters, getting a no-decision as the Tigers lost the game in extra innings. After a win against the Tampa Bay Rays on June 28, Scherzer became the first Tigers pitcher to ever start a season 12–0, surpassing the 11–0 start from George Mullin in 1909. With a win against the Toronto Blue Jays on July 3, Scherzer also became the first major league starter to begin a season 13–0 since Roger Clemens in 1986. The streak ended with a loss to the Texas Rangers on July 13. On July 1, Scherzer was selected by player vote to represent the American League in the 2013 All-Star Game. It was his first All-Star selection. On July 15, Scherzer was selected to start the game by his manager, Jim Leyland, who managed the AL All-Star team this season. Scherzer pitched a perfect 1-2-3 inning in the game, striking out Joey Votto for one of the three outs. Entering the All-Star break, Scherzer had a 13–1 record, 3.19 ERA, 0.98 WHIP and 152 strikeouts in 129 2⁄3 innings pitched. On August 8, Scherzer recorded his 1,000th career strikeout when he fanned Jason Kipnis of the Cleveland Indians. 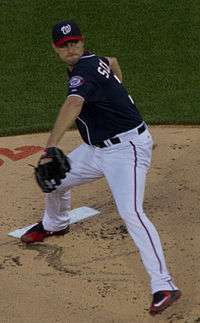 With a win over the New York Mets on August 24, Scherzer became the third pitcher in major league history to start a season 19–1, following Roger Clemens in 2001 and Rube Marquard in 1912. On September 20, after a 12–5 win over the Chicago White Sox, Scherzer became the first major league pitcher to reach 20 wins. Scherzer became the second Tigers pitcher to reach 20 wins since Bill Gullickson in 1991, following Justin Verlander in 2011, and the 45th in Tigers history. He finished the regular season at 21–3, with a league-leading 0.97 WHIP, 2.90 ERA, and a career-high 240 strikeouts. He was the only 20-game winner in the majors in 2013. Scherzer's stellar season earned him the 2013 AL Cy Young Award, receiving 28 of 30 first-place votes. Scherzer had a dominant performance in Game 1 of the 2013 ALDS, recording 11 strikeouts and giving up just one hit through the first six innings, before surrendering a 2-run homer to Yoenis Céspedes. He finished with 7 innings pitched, giving up three hits, as he and the Tigers won the game, 3–2 over the Oakland Athletics. He struck out Josh Donaldson, Brandon Moss, and Josh Reddick twice. Scherzer was in line to make a Game 5 start in the same series, but facing elimination in Game 4, manager Jim Leyland chose to bring him in as a reliever in the seventh inning. Scherzer gave up the go-ahead run in the top of the inning, but the Tigers retook the lead in the bottom of the frame. Scherzer then loaded the bases with no outs in the top of the eighth, but wriggled out of trouble by striking out Josh Reddick and Stephen Vogt, then getting Alberto Callaspo to line out to center field. The Tigers won the game, and Scherzer earned the victory to go to 2–0 in the series. Scherzer continued his brilliance into the 2013 ALCS against the eventual World Series champions Boston Red Sox. In Game 2 of the series, he no-hit Boston for 5 2⁄3 innings, eventually surrendering two hits and a run in the bottom of the sixth. He left the game with a 5–1 lead after seven innings, striking out 13. But a quartet of Tiger relievers blew the lead in the eighth inning, and Boston won it, 6–5, on a walk-off single in the ninth. Scherzer was the losing pitcher in the Tigers 5–2 loss to the Red Sox in Game 6, the deciding game of that series. On May 5, Scherzer struck out nine Houston Astros batters in eight innings of a 2–0 victory. This was his seventh straight game from the start of the season with at least seven strikeouts, establishing a Detroit Tigers franchise record. The streak ended May 10 against the Minnesota Twins, when he struck out 6 batters in 6 innings. The Major League record for consecutive 7+ strikeout games to start the season is nine, accomplished by Bob Feller in 1946. On June 12, in his 179th career start, Scherzer pitched his first career complete game shutout in a three-hit 4–0 win over the Chicago White Sox. He struck out eight batters in the contest and threw 113 pitches. This was the longest stretch any major league starter had gone without a complete game since 1900. On July 6, Scherzer was named to his second AL All-Star team by way of John Farrell's manager selection. He pitched a scoreless fifth inning in the game, giving up one hit, striking out two, and earning the win for the AL. Scherzer finished the 2014 season with an 18–5 record, 3.19 ERA and 1.175 WHIP. He pitched a career-high 220 1⁄3 innings and struck out a career-high 252 batters. His 18 wins tied for the AL lead, along with Corey Kluber and Jered Weaver. Max made his only postseason appearance of 2014 in Game 1 of the American League Division Series against the Baltimore Orioles. He was tagged with the loss after surrendering five runs (all earned) in 7 1⁄3 innings. On January 21, 2015, Scherzer was signed by the Washington Nationals to a seven-year, $210 million contract. The contract included a $50 million signing bonus that would be paid out over 14 years, the largest contract deferral in MLB history. On January 22, it was reported that Scherzer's contract calls for his salary to be $10 million in 2015, and $15 million in each of the next three seasons. It then increases to $35 million a year in 2019, 2020 and 2021, the seasons in which his deferrals begin. In addition, his contract also includes several award bonuses. He would receive $250,000 for winning a Cy Young, MVP or World Series MVP award, $150,000 if he's the MVP of the League Championship Series and $100,000 if he makes the All-Star team, wins a Gold Glove or wins a Silver Slugger award. The contract does not contain a no-trade clause. Scherzer made his first start for the Nationals during opening day against the New York Mets on April 6, 2015, where he struck out 8 batters in 7 2⁄3 innings as the Nationals lost to the Mets 3–1. On June 14, 2015, he pitched his second career complete game, giving up one hit and one walk in a 4–0 shutout against the Milwaukee Brewers. Scherzer's 16 strikeouts were a career high and also set a Nationals team record for most strikeouts in a game. Six days later, he no-hit the Pittsburgh Pirates 6–0 at Nationals Park. After retiring the first 26 batters, he came to within one strike of a perfect game, only to hit the 27th batter, José Tábata. Scherzer secured the no-hitter by retiring Josh Harrison on a fly ball one batter later. This was the 13th time the 27th and presumably last batter disrupted a perfect game. Scherzer's ERA during the month of June was 1.79. Scherzer achieved a game score of 97 or more twice in the 2015 season, a feat only accomplished two other times, by Nolan Ryan in 1990 and Pedro Martinez in 2000. Scherzer threw his second career no-hitter, and second of the season, against the New York Mets on October 3, striking out a career high 17 batters with no walks, the only base runner coming from a throwing error by Yunel Escobar. Several baseball analysts and pundits described Scherzer's second no-hitter as one of the greatest pitching performances of all time, and perhaps the most dominant no-hitter ever pitched, based on his number of strikeouts, lack of walks issued or batters hit by pitch, and dominance of the opposing roster on the third time through the lineup; at one point, Scherzer had struck out 9 straight Mets, just one shy of the Major League record set by Tom Seaver in 1970. On May 11, 2016, Scherzer struck out 20 Detroit Tiger batters, his former team, to tie the record for strikeouts over nine innings in a single game, held by Roger Clemens (twice), Randy Johnson, and Kerry Wood. Scherzer became the first pitcher to strike out 20 batters in a regulation game in the 21st century. He accomplished the feat and earned the win in a matchup with former Nationals teammate Jordan Zimmermann. In addition, Scherzer joined Johnson as the only other player with a career 20 strikeout game and a no-hitter. Scherzer also became the 17th pitcher all time to record a win against all 30 MLB teams in his career. 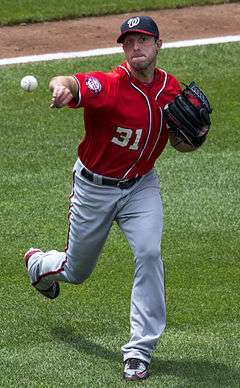 On July 8, 2016, Scherzer was named as the National League All-Star Game roster replacement for Washington Nationals pitcher Stephen Strasburg due to Strasburg just recently coming off of the DL. Scherzer was named the National League Cy Young Award winner on November 16, 2016, his second Cy Young Award, and became just the sixth pitcher in Major League Baseball history to win the award in both the American and the National Leagues. He was the 2016 Esurance MLB/This Year in Baseball Award winner for Best Pitcher. Max Scherzer will play for Team USA in the 2017 World Baseball Classic. With a low three-quarters delivery (nearly sidearm) Scherzer throws four pitches: a four-seam fastball with good movement averaging 92–96 mph (topping out at 99 mph), a slider at 85–86 mph, a changeup at 84–85 mph, and an occasional curveball at 78–79 mph. The slider is his primary off-speed pitch to right-handed hitters, and the changeup is primarily used against left-handed hitters. Scherzer throws the curveball sparingly, about four times a game. He said in early 2016 he is working on adding a cutter to his arsenal. Scherzer's younger and only brother, Alex, committed suicide early in the summer of 2012. Alex had a passion for analyzing advanced baseball statistics or sabermetrics. Scherzer learned the value of sabermetrics from his brother, and he implements this as a tool to improve his game. Since Alex's death, Scherzer dedicates every start to his late brother. Scherzer has heterochromia iridum, which means that one iris is a different color from the other; his right eye is blue and his left eye is brown. On June 12, 2011, the Detroit Tigers distributed a bobblehead doll depicting Scherzer, with the condition correctly portrayed. 1 2 "Max Scherzer joins rare company with second no-hitter of 2015". ESPN. October 3, 2015. Retrieved October 3, 2015. ↑ Gregorian, Vahe (July 14, 2013). "Coping Mechanism". The Kansas City Star. Roopstigo.com. Retrieved July 11, 2015. ↑ "Six chosen for University of Missouri Athletics Hall of Fame". KTVO-TV. January 9, 2012. Retrieved January 10, 2012. ↑ Gilvert, Steve. "D-backs sign first-round pick Scherzer". Arizona Diamondbacks. Retrieved 22 July 2015. ↑ Ketchum, Don (April 30, 2008). "Scherzer to make 1st start Monday". Azcentral.com. Retrieved October 9, 2011. ↑ Falkoff, Robert (September 25, 2008). "Wainwright secures winning season". mlb.com. Retrieved June 19, 2013. ↑ Hoch, Bryan (December 9, 2009). "Granderson joins Yanks in three-way trade". MLB.com. Retrieved October 9, 2011. ↑ Beck, Jason (May 16, 2010). "Sizemore, Scherzer optioned to Triple-A: Guillen to play second base on return from DL". MLB.com. Retrieved May 16, 2010. ↑ "Max Scherzer Statistics and History". Retrieved July 1, 2013. ↑ "Max Scherzer strikes out 15 but falls 1 short of Tigers record". espn.com. May 20, 2012. Retrieved July 1, 2013. ↑ "Year-by-Year Top-Tens Leaders & Records for Strikeouts". baseball-reference.com. Retrieved July 1, 2013. ↑ "Detroit's Scherzer moves to 11-0 as Tigers rout Boston". June 22, 2013. Retrieved July 1, 2013. ↑ "Scherzer remains unbeaten, beats Rays to improve to 12-0". June 28, 2013. Retrieved July 1, 2013. ↑ "Max Scherzer becomes first pitcher since 1986 to start season 13-0". June 28, 2013. Retrieved July 4, 2013. ↑ "Scherzer suffers first loss of season, Rangers rout Tigers". July 13, 2013. Retrieved July 15, 2013. ↑ "Matt Harvey, Max Scherzer on hill". July 15, 2013. Retrieved July 15, 2013. ↑ Iott, Chris (August 8, 2013). "Detroit Tigers' Max Scherzer picks up career strikeout No. 1,000 in first inning against Indians". Retrieved May 16, 2014. ↑ "Scherzer's gritty effort in duel nets win No. 19". MLB.com. August 24, 2013. ↑ "Scherzer secures No. 20 as Tigers cut magic number". MLB.com. September 20, 2013. ↑ "Stellar season earns Scherzer AL Cy Young Award". MLB.com. November 13, 2013. ↑ "Max Scherzer strikes out 11 as Tigers take Game 1 of ALDS". ESPN.com. Associated Press. October 5, 2013. ↑ Caple, Jim (October 5, 2013). "Run support no big deal for Scherzer". ESPN.com. Retrieved May 17, 2014. ↑ "Tigers rally late, hold off A's to force Game 5 in ALDS". cbssports.com. October 8, 2013. Retrieved October 9, 2013. ↑ "Ortiz hits grand slam as Red Sox sting Tigers to tie up ALCS". cbssports.com. October 14, 2013. ↑ Perry, Dayn (January 17, 2014). "Tigers sign Max Scherzer for 2014, avoid arbitration". cbssports.com. ↑ "Cabrera picks up Scherzer to lead Tigers past Twins". cbssports.com. May 10, 2014. Retrieved May 19, 2014. ↑ "Scherzer shuts down Astros; Tigers win sixth straight". cbssports.com. May 5, 2014. Retrieved May 6, 2014. ↑ "Scherzer goes the distance for first time to beat Sale". MLB.com. June 12, 2014. Retrieved June 12, 2014. ↑ "All-Stars unveiled, including 25 first-timers". mlb.mlb.com. July 6, 2014. Retrieved July 8, 2014. ↑ "Jeter, MVP Trout lead AL past NL in All-Star Game". cbssports.com. July 16, 2014. Retrieved July 18, 2014. ↑ McCosky, Chris (September 26, 2014). "Tigers' Max Scherzer pleased with his encore season". The Detroit News. Retrieved September 26, 2014. ↑ Slonksnis, Catherine (September 27, 2014). "The 2014 season was a worthwhile investment for Max Scherzer". Yahoo! Sports. Retrieved September 27, 2014. ↑ "Orioles set postseason team record with 12 runs in Game 1 win". espn.com. Associated Press. Retrieved October 3, 2014. ↑ Ladson, Bill (January 21, 2015). "Scherzer has 7-year, $210M deal with Nats". MLB.com. Retrieved January 21, 2015. ↑ "Nationals land RHP Max Scherzer". ESPN. January 19, 2015. Retrieved January 21, 2015. ↑ "Lots of numbers: Inside Max Scherzer's huge contract". Detroit Free Press. January 22, 2015. Retrieved January 22, 2015. ↑ "Final years of Scherzer pact deferred". ESPN. January 22, 2015. Retrieved January 22, 2015. ↑ Calcaterra, Craig. "Scherzer's Nationals debut doesn't go well as expected.". nbcsports.com. NBC Sports. Retrieved 7 April 2015. ↑ Rosiak, Todd (June 14, 2015). "Max Scherzer close to perfect vs. Brewers". Milwaukee Journal Sentinel. Retrieved June 14, 2015. ↑ Wagner, James (June 20, 2015). "Nationals Max Scherzer throws no-hitter after hit-by-pitch spoils perfect game". The Washington Post. Retrieved June 20, 2015. ↑ Schoenfield, David (June 20, 2015). "Max Scherzer now the best pitcher in the game". ESPN.com. Retrieved June 20, 2015. ↑ McKinley, Eric Garcia (June 21, 2015). "Max Scherzer's run has been historic and charged with emotion". SBNation. Retrieved June 21, 2015. ↑ Cassavell, AJ (October 4, 2015). "WAS SCHERZER'S NO-NO THE BEST EVER?". Sports on Earth. Retrieved October 4, 2015. ↑ "Max Scherzer just pitched one of the greatest games of all time". ESPN. October 3, 2015. Retrieved October 4, 2015. ↑ Brown, David (October 3, 2015). "Was Max Scherzer's no-hitter vs. Mets the most dominant ever?". CBS Sports. Retrieved October 4, 2015. ↑ Strang, Katie (May 11, 2016). "Tigers unable to solve former teammate Max Scherzer". ESPN.com. Retrieved May 11, 2016. ↑ Stephen, Eric (May 11, 2016). "Max Scherzer ties MLB record with 20 strikeouts against Tigers". SB Nation. Retrieved May 11, 2016. ↑ "Scherzer becomes 16th pitcher to beat every team". Detroit News. May 11, 2016. Retrieved May 11, 2016. ↑ Footer, Alyson (November 18, 2016). "Grand finale: MLB Awards put cap on season: Trout is Best Major Leaguer; Indians, Cubs win big". MLB.com. Retrieved November 19, 2016. ↑ "PitchFx » Overview". FanGraphs. Retrieved July 22, 2016. ↑ "PITCHf/x Player Card: Max Scherzer". BrooksBaseball.net. Retrieved April 29, 2012. ↑ Simon, Andrew (February 26, 2016). "Scherzer reportedly adding cutter to arsenal". MLB.com. Retrieved March 11, 2016. ↑ Beck, Jason (June 26, 2012). "Heavy-hearted Scherzer discusses brother's death". MLB.com. Retrieved August 14, 2014. ↑ Sanchez, Robert (April 6, 2013). "Max Scherzer: A brother's passage". ESPN.com. Retrieved August 14, 2014. ↑ Kaduk, Kevin (October 19, 2012). "Max Scherzer parties with custom mismatched goggles for his mismatched eyes". Yahoo! Sports. ↑ Passan, Jeff (March 4, 2006). "Unmatched eyes of the Tiger". ↑ Miller, Doug (July 7, 2014). "Did you know? 2014 All-Star fun facts". MLB.com. Retrieved August 14, 2014.